Marilyn Cornwell Blog: New this Christmas! Is there something new this Christmas? We who are older seem to have seen everything Christmas. So what could be new this year? It's right in front of us: this is a Trump Christmas! What's different about a Trump Christmas? "It was a warm day at the White House with the scent of roses in the air and it hardly felt like Christmas. Yet the holiday season was in full swing - a week earlier than many of his predecessors chose to begin. Trump likes to do things differently, though. In that spirit, here are five ways that his Christmas is unique." This year the tree arrived early - three days before Thanksgiving - apparently because of the president's travel plans. During the presidential campaign, Trump would tell his supporters that people would soon be saying "Merry Christmas" again, instead of "happy holidays", which he has derided as politically correct. It's not the kind of gift you'll find under the tree. Tax cuts don't come covered in wrapping paper. The president has described his proposed tax cuts as "a great, big, beautiful Christmas present" for Americans. He's the first president in more than a century without a pet - so no cute pictures of a first dog, marking another departure from tradition. Under previous administrations, the president held a press conference in the briefing room in December. Trump's not likely to do that. One administration aide told me that she thinks it's beneath him to appear in the briefing room. Instead the president talks to reporters on the south lawn, in the Oval Office or on Air Force One, places where he seems to feel comfortable. Besides that, he's invited a smaller number of reporters to the White House to celebrate the holidays. The party invitations have gone out, but a CNN spokesperson said they weren't going to attend because of "the president's continued attacks on freedom of the press and CNN". That suits people who work for the president just fine. 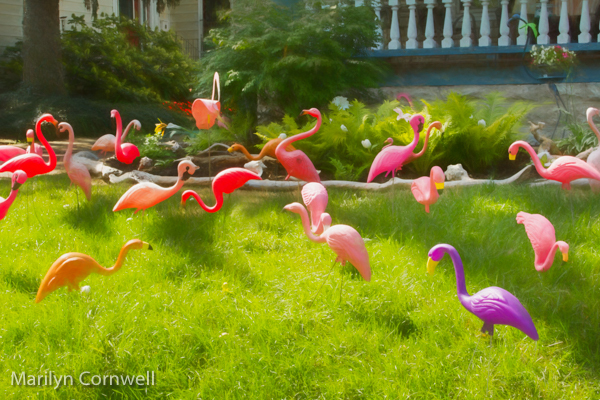 Our picture today comes from the Buffalo Garden Walk this year - it is here to distract us from our Trump Christmas - a festive Flamingo display in one front garden.